Should military do more humanitarian relief? Military assets performing essential humanitarian and disaster relief (HADR) work became front page news again this month. Aircraft both fixed wing and rotary were used to great effect in Nepal to help alleviate the horrific conditions following the earthquake and subsequent aftershock. The only barrier was approval from Kathmandu to allow them entry. 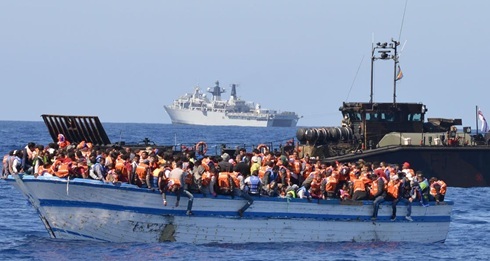 Elsewhere in the Mediterranean, naval and coastguard ships have been picking up an ever growing number of refugees and economic migrants abandoned in the sea by human traffickers. In particular the British use of the amphibious warfare ship HMS Bulwark to rescue 300 refugees in late-May stands out. It might seem odd that a ship designed to land troops ashore during a conflict would be tasked with this role, it is certainly more costly to run a ship for this work compared to an offshore patrol vessel. But this is a tactic by the Royal Navy to prove that its platforms can be used for multiple tasks. A defence review is expected in the UK by the end of the year and the fear is that amphibious ships will be first on the chopping board. This tactic was less successful prior to the last review in 2010 when the Royal Navy sent an aircraft carrier to ‘rescue’ stranded British tourists from Spain following the eruption of a volcano in Iceland that grounded passenger aircraft in Europe for a few days. The carrier fleet was axed all the same. But whatever happens, companies that can provide platforms that have a HADR role are going to be in demand and could be a deciding factor in any equipment procurement competition. With defence cuts abound in Europe and the US, it means fewer platform numbers therefore the more tasks they can do the better. At the World Humanitarian Summit on humanitarian civil-military coordination in Singapore in April it was highlighted by the Singaporean defence minister that militaries are becoming more engaged in HADR. It was noted that militaries are not specifically set up or organized to respond to disasters and are expensive to deploy in this role. What is missing here is a clearly defined military doctrine for HADR that outlines the scope of the mission and the operations in the immediate aftermath of an event and then how this will transition to civilian organisations as they enter the fray. Without standard operating procedures for military HADR efforts the defence minister said that they can become ‘unsustainable, ineffective and inefficient’. In May 2016 the UN will host the first World Humanitarian Summit in Istanbul, Turkey where all parties from NGOs to the military will thrash out just where and how HADR should proceed. Well it’s not new. Kosovo, Afghanistan, S Leone, Iraq, Pakistan, Indonesia, Haiyan, Haiti,…. UK is much better organised than the US. Military platforms doing this work is certainly not new. But the issues now are that with reduced budgets the military is looking for maximum utility and to show politicians they have more capabilities that need preserving. Plus companies that have products that can do HADR means they have an extra selling point. Industry is focussing on this a lot more, which is new.